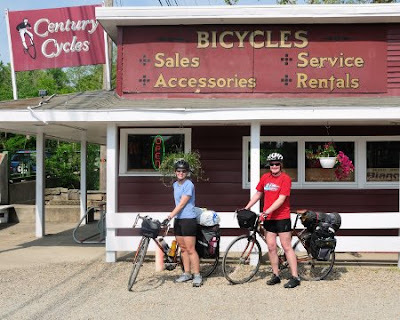 Century Cycles Blog: Touring season has begun! We've been seeing increasing numbers of self-supported bicycle tourists passing through and stopping in our stores over the past couple of years. We had our first group of the year in Peninsula during this past Memorial Day weekend. 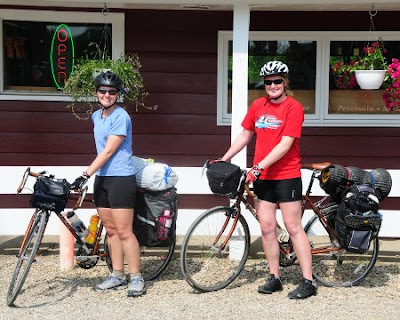 This pair of young women (Beth and Carrie) had left Rochester, New York six days prior, and were taking the Underground Railroad Bicycle Route to the south to Kentucky, where it connects with the TransAmerica Route, which they will follow all the way to Astoria, Oregon. You're right; the color does look a lot like the Masi Speciale CX. They were both Trek 930 touring bikes with steel frames. Btw, I think a great entry on here sometime, when you get a moment or two, would be to describe how one prepares for a long haul self-sustained trip such as this... I'm really interested in these kind of trips (might like to do one someday) but I have no idea what goes into planning of such an adventure. Do you have any insights you could share?